This deliverable describes the development and establishment of showcases in each of the DESSIN demonstration sites. Each of the showcases was set up in a distinct way, reflecting the local conditions, target audiences and wishes. 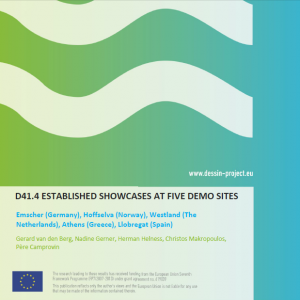 The overall objective of the showcases is to promote the uptake of the innovative solutions enhancing ecosystem service, developed in DESSIN, and show relevant stakeholders, authorities, decision makers, researchers and the general public their potential. The showcases also provide a playground for new technologies to be demonstrated in a real life environment. The showcases have a clear role during the DESSIN project, but we also foresee active showcases beyond the DESSIN lifetime to endorse the uptake of the innovative solutions. The showcases will be finalised and updated in the last year of DESSIN.